A few weeks ago I ordered a special delivery for Christmas. These Jersey Royal new potatoes were specially grown to be ready and harvested in the week before Christmas. Dug up, packaged and posted within a few days of Christmas, I just had to have a little sample before the big day. The mint is supermarket bought! if the new potatoes are out of season then so is the mint! Needless to say the end product was absolutely perfect! Matron is looking forward to her Christmas Dinner. I drove up to the Brussels Sprout capital of the world yesterday. A short journey up the A1 to Bedfordshire to pick up a couple of sticks of Brussels Sprouts for my Christmas dinner. These were cut just yesterday morning. You can just feel the freshness, everything about them is perfect. I took a few of the sprouts from the bottom of the stick, and this will keep fresh for weeks outside in a few inches of fresh water. I LOVE Brussels sprouts, and these are just perfect. It's war out there Down on the Allotment! my precious little broccoli seedings are being marmalized by gangs of delinquent hoodie pigeons! I planted these 'Rudolph' early purple sprouting broccoli seeds in the Summer and I have nursed them through the Summer attack of slugs, snails and caterpillars. I do not intend to lose them now to a gang of cowardly pigeons. 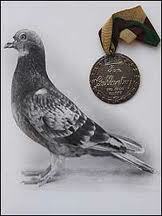 Don't get me wrong, I am not pigeon prejudiced, some of them are amazing creatures. Take 'Scotch Lass' for instance. in 1945 she was awarded the Dickin Medal for gallantry whilst serving in World War 2. Her citation read, "For bringing 38 micro photographs across the North Sea in good time although injured" that is my idea of a brave pigeon. 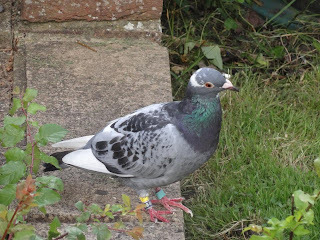 Or there is the sporty pigeon (who took a short break on my allotment earlier this year) who trains hard to achieve a peak of physical fitness in a display of awesome navigational skills and sporting prowess. 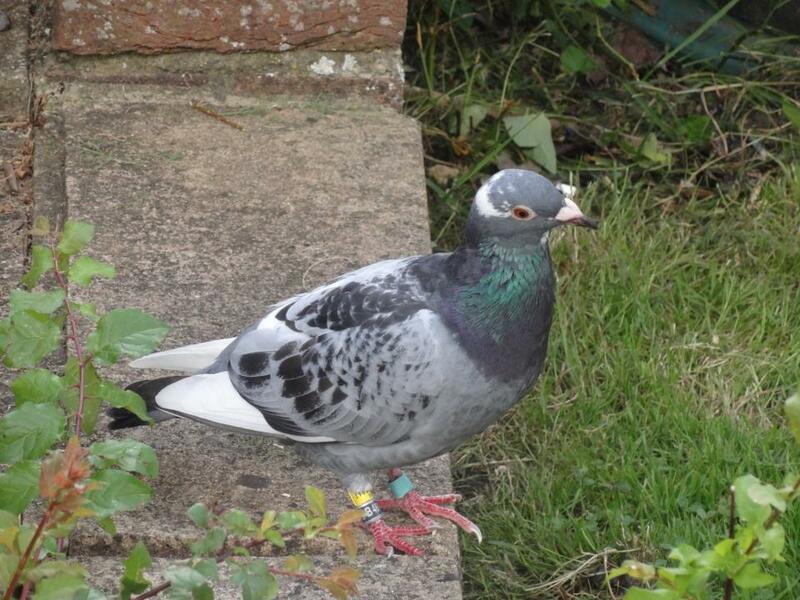 Then there is the nasty, fat wood pigeon that lurks around and steals from my allotment. Despite hanging CDs, tin foil, cotton thread and owning a hunter-killer yellow Labrador.. I'm just not winning the battle. They just fly away up into a nearby tree and laugh at me, only returning to have another munch as soon as my back is turned. I just may have to give up and wish them a very Merry Christmas.. wrapped in pastry and served with bread sauce, gravy.. oh yes.. and fresh broccoli! Merry Christmas Mr Pigeon. Regular readers will know that 'Matron doesn't do flowers!'.. so relax because this is a young pomegranate growing in the Jardim Botanico in Madeira. There is a whole section devoted to agricultural tropical fruit and veggies. It gradually grows into something I would recognize as a baby pomegranate. And coffee beans on bushes here can be recognized too. One of the big surprises to me was seeing how Macademia Nuts grow. An ENORMOUS evergreen tree towering above us with clusters of these little green fruit. The green outer skin hardens to brown then splits. Inside the brown skin is a hard brown nut. Inside the hard, round nut is the macademia nut. You have to be a most determined squirrel to get into one of these, but still there were plenty of empty nut shells on the ground with tell tale holes nibbled in them! And these delicious 'Custard Apples' are growing everywhere on the Island of Madeira. Known and sold locally as Anonas, the texture is a bit like a very soft, white mango, but tastes like a cross between an apple and vanilla custard! If you've never tried one, go to a specialist shop and buy one. Just make sure they are nice and ripe first! Last week in Madeira I went on a walk along one of the many 'Levadas' up in the hills. This one was the Mimosa Valley just above the town of Machico. You can see that the steep hills have been managed into tiny terraces, volcanic rocks are piled into small walls and so small terraces of flat land are made on the hillside. Virtually every square inch is used for growing fruit and vegetables! Every Sunday in most towns there is a farmers market where you can buy an amazing range of home grown food from the farmers that grow it themselves. There is no agricultural machinery here, everything is done by hand. I was interested to see that maximum use of space was employed using the same space to grow two different crops which do not compete. Above here the sweet potatoes are grown on top of ridges and broad beans are planted at the bottom of the ridges. And this is wonderful, rich, red volcanic soil which is so fertile. Wherever I travel in the World I try to discover and visit the local fresh produce market. This one in Funchal, Madeira is one of my favourite. Ripe fruit of every variety you could imagine are freshly picked and displayed at the 'Mercado dos Lavradores' in the town centre. You have to be careful that you know how much you are going to pay, the prices are not always displayed and some stallholders are quick to take advantage of tourists. I was interested to see these local squash for sale in the market. This variety seems to have a waxy or yeasty bloom on the surface and they are to be seen drying on rooftops all over the Island. These lovely peppers make for a fantastic display in the market. Sugar cane is also an interesting ingredient for sale here. More to follow! Blogging to you now from the sunny island of Madeira! Warm sunshine here and lots of fruit and veggie pictures to share with you when I get back at the weekend.